Get Your Head Into The Cloud - Miria, Inc.
At a conference last month, I sat in a room with several product managers from different OEM companies. The speaker was there to talk about the value of cloud computing and why the current trend was continuing to escalate into all markets, including manufacturing. He was quite convincing. He addressed the biggest concerns over privacy and security of data and concerns over a loss of control. He discussed at length the tremendous cost advantages and the ability to rapidly achieve value and reduce project life cycles. Real time continuous improvement and reduced maintenance management costs were also key elements in his message. I was convinced, but I was already a believer before he spoke a word. It’s part of my DNA to be looking outside of what we do today, and I have been absorbing everything I can on this subject for quite a while. I guess I am always trying to find a better way. That same DNA gets me in trouble sometimes, for I will sometimes pursue a solution based on innovation and technology before the market and the users are ready for it. 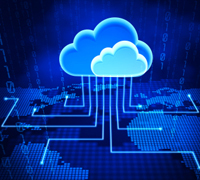 Is that the case now with Cloud Computing in the industrial and manufacturing world? After the speaker was finished, the time came for questions and answers. The crowd in the audience wasn’t as convinced as I was. As a matter of fact, some very smart people took the immediate position of, “Great stuff, but not for my customers.” Can you explain further, asked the speaker. “It’s simple,” explained the product manager of a well known OEM, “Customers in manufacturing will never embrace the use of this technology even if it is in a private cloud.” He wasn’t alone in his opinion. There were dozens of brilliant engineers and sales people in the room who quickly jumped to his defense and the conversation evolved along these lines for about 15 minutes before the speaker reached the point of exasperation. It was like trying to convince Eskimos that global warming was going to change their world when it was still 60 degrees below zero in the igloo.